Yes WAY over that. I had them bi amped. Crown itech - 9000HD on woofers 2,500 wpc at 4ohms. and a Mcintosh Mc452 on mids and tweeters. They where as loud or louder as my Jubilee's and sounded great at concert volume. That's 2 pairs stacked in Corners. Jubilee's will crush a single pair. Mike. I had the JBL 2380 ( clones ) in both pairs of my Cornscala's and never heard any kind of quacking, something else must be the cause. Mike. First let me say this is my unscientific opinion based on my experience in my room. For rap type music KP600'S are hands down the winners. They also have the best detail and are exceptionally clear sounding. The clarity of these are what suprised me the most. They are not nearly as directional as the others so i can walk all around the room and the sound stays the same. What they don't do as good as the others, mainly due to the 402 horn on the jubes/mwm's is imaging and sound stage. Jube's and mwm's / 402 have that "headphone" 3D kind of sound where the KP600'S are more like a wall of sound and I can feel the subs gush air by my face from 18 feet away, they are very impressive speakers. 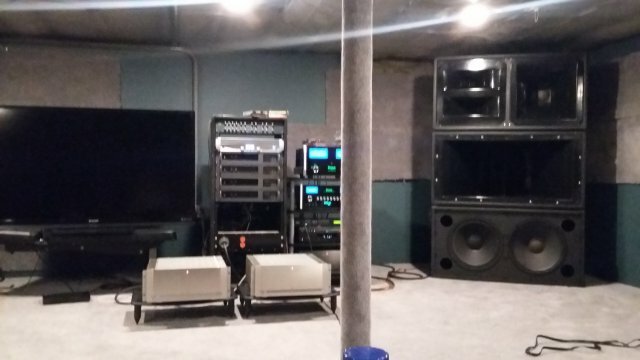 My room is in the basement, my girlfriend says from upstairs they sound better than the jubes or mwm's. Mwm's/402. I really like these for rock music, they just slam nice and clean and have a fantastic sound stage when you're in the sweet spot. 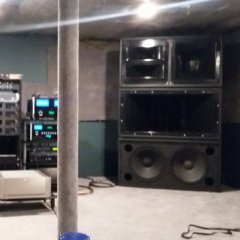 They are much more directional than the KP600's so walking around the room you can definitely hear the sound change and you lose the sound stage from the sweet spot. I do feel the mwm bass bins resonate more than jubes do. The mwm's seem to rattle things around upstairs even more than the KP600's. Jubes are alot smaller and they sound it by comparison. The bass bins don't have the slam of the others. 2 x k31woofers in a horn half the size just can't win against the others in the Slam/SPL department. Jubes are also directional like the mwm's so they definitely have a sweet spot but Jubes do everything well. What the jubes do better then both the others are the cabinets are built so solid I don't hear any resonating or vibrating from the cabinets at all even when cranked to the limit. Right now I am using the jubes as surrounds for the mwm's and I'm pretty happy so I'm not entirely sure what I will do next. I'll probably swop the kp600's back in and then decide on what I'm going to sell. I'm getting a bit tired of moving all these huge speakers around. I've been kicking the idea around of making a "Cornscala wall" that would consist of 6 pairs for the front stage and 2 pairs for surrounds. Mike. I've had alot of big stuff shipped to me all the way up to Maine so there are people out there who will do whatever it takes to get what they want. I've had 8 MWM bass bins, complete KP600 system, 2 tuba tht subs, 402 horns, 4 pairs of Cornscala's, Jubilee's. .. all shipped to me. I used Uship for alot of it and only had one bad experience shipping the KP600's, the dude thought he could load them on a box truck "dock high" by himself. Mike. I have MWM'S, Jubes and KP600's. I use two amps for my jubes. I've tried many different high end amps on the bass bins and I like my Crown I-tech the best. The bins really come alive with alot of power and higher dampening factor. Class A for tops. Sounds amazing. The horn on the Jubilee is not metal. Personally I think they are one the best looking speakers Klipsch offers and if you have corners they don't take up much room at all. I only have this pic on my phone. I can take more pics tonight. All i think it would take is an adapter plate with 4 holes same as the k77 to mount to the horn and have the holes to mount the DE120 or DE110 to the plate and it should work. I could probably make one out of wood but I'd rather have one machined like the ones you make. I'll post a couple more pics when I get home. Currently own Chorus I, found Cornwall IIs for $850 - worth the upgrade? Md5150 replied to roughlytraded's topic in Alerts! They might go lower but I certainly wouldn't say they have better bass. In my experience Chorus bass hits you in the chest harder. The woofers handle alot more power and to my ears sound clearer in the 150-500hz range, and they take up less space. The only way for him to really find out is to compair them in his room. If you can buy the CW without selling the Chorus I would, you really can't go wrong for 850 and you can have fun doing the comparison. I just wouldn't sell the Chorus to buy the CW, you might regret it and have to hunt down another pair of Chorus. To often I have made the mistake of selling what I have to buy something else only to regret it. I would keep the Chorus. I've owned Chorus 1 and 2 as well as Cornwall 1 and 2, to my ears the Chorus sounded better. The woofer handles more power. You might like the Cornwalls better but won't know until you hear them both under equal conditions. I would upgrade the Chorus with Crites crossovers and install a DE120 tweeter with the adapter a forum member just started selling. Those would be hard to beat. Nice work! I have a pair of kp600's that uses 2 k77 tweeters mounted to a duel manifold horn. Any idea if these adapters would enable me to use DE120 or 110? I thought the same thing a year ago. With XConsole it's easy. I'm no expert by any means but I'm pretty good with it now. I never messed with active crossovers before the xilica and i didn't have the slightest clue what I was doing, with help from Chris I was able to get my Jubilee's sounding great. I've since used it for two way mwm's, tuba subs, and most recently for 4 way KP600's with great results. Just use XConsole and not the front pannel on the xilica. Chris, I would be interested in trying out those new settings you came up with using the Bessel Crossover. MWM and jubilee bass bins are very different. It might "work" but it wouldn't sound as good as it should and might sound very bad. I cross my Faital pro hf20at between 400 and 450hz with 48 db slope on jubilees and mwm's with no problems and I listen very loud. Amps I've used with them are Parasound JC-1, Mcintosh mc452. They are fantastic drivers. Gas or electric oven? What's everyone's preference if you could choose. Hi, Before I get ahead of myself with questions, are you able to ship these? I didn't see your location in the add. I am in Maine. Thanks, Mike. Has anyone actually tried a k48 in a mwm bass bin? and if so was there any benifit over the k43? I'm asking because I have 4 k48's sitting around and I'm also in the process of repainting and re sealing the mwm's so I'm pulling the k43's out anyways. I figure it might be a fun experiment to try and I can easily swop the k43's back in. Also I am wondering if there are any newer modern style woofers, like ones with neodymium magnets that would outperform both in a 2way mwm/402 setup? I have subs so I don't need them to go any lower like k33's, i care more about midbass slam, overall clarity and power handling. Mike. Think I found what I need. It looked like 2 gaskets glued together. The biggest I could find was 3/8 thick. The surround on these woofers bulge alot. Does anyone know where i can find these? I'm not even sure what they're called, woofer rings? As you see by the picture mine is in need of replacing, I've done a few quick searches and haven't found what I'm looking for. This is for a 15' dayton subwoofer for one of Tuba tht subs. It looks to be about 3/4' thick. Thanks! Mike. Owned both liked the Chorus much better. K48 can handle more power and tighter bass. I've never seen an adjustment labled input sensitivity on xilica or is that the same as adjusting input gain? Build a man cave! I don't get much crap anymore.